People’s Palace Projects and Streetwise Opera teamed up with English organisation Cafe Art to launch the Calendar My São Paulo, which showcases the work of more than 90 people with experience in homelessness in Brazil who – at the beginning of November – used disposable cameras to tell the stories of their city and their lives. “When they gave us the cameras, we forgot about the world”, said Matheus Leandro Barbosa, who has been living on the streets for five years. Matheus had two photos chosen to be a part of My São Paulo calendar. He said: “I wanted to portray people I see every day in the streets, because I think this is what the project is all about: telling people’s stories”. Another photographer, Diogo Virolli, took a photo of a house with no windows, because it reminded him of his childhood home, in Northeast Brazil. “It reminded me of when I was a child. I was very happy then,” he said. The concept behind the project comes from English organisation Café Art, which has carried out a similar initiative in London for the last three years. 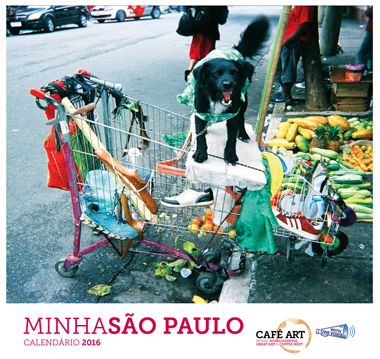 The My São Paulo Calendar was launched during the Human Rights Festival of São Paulo. It’s a limited edition, and it will be sold for £9.99 in the UK. To purchase a copy, visit cafeart.org.uk. With One Voice is supported by The British Council Brazil and Calouste Gulbenkian Foundation UK Branch.